Watch this video of putative President Obama at http://www.telegraph.co.uk/news/worldnews/us-election/8712959/Barack-Obama-accuses-Congress-of-holding-back-recovery.html. His point, which was also made by George Washington in his Farewell Address of 1796, http://www.ourdocuments.gov/doc.php?flash=true&doc=15, is that we can bring our nation back to greatness if politicians would only put country before party. But what is Obama talking about? When we talk about putting country before party, are we not really saying that we should put first what is good for the country as a whole rather than what is good for a particular political party? But how could Obama pretend to promote and defend the greater good of the country without at the same time honoring and respecting the rule of law that keeps that country together? The answer is that the country and the rule of law are inseparable. We cannot have one without the other. The rule of law is nothing more than intelligence and reason applied to produce a just and predictable result concerning the distribution to people of benefits and obligations offered by the society in which they live. It is a fundamental component of good government and its proper administration. 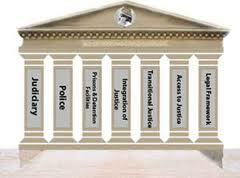 The rule of law, joined with military might, has made our country great and will allow us to prevail in the future. The Founders and Framers, being passionate students of ancient history, recognized the vital importance of the rule of law. In fact, they saw the rule of law to be so critical to life, liberty, and the pursuit of happiness that as a testament of that understanding they gave us a constitutional republic in which military power is subordinate to civilian power. Indeed, the rule of law, which picked up where the Roman Empire ( http://www.usu.edu/markdamen/1320Hist&Civ/chapters/08ROMFAL.htm) left off when it transitioned into the medieval ages, has brought both quantity and quality to world populations. It has given our lives order and civility, allowing Americans to freely study, pray, work, trade, and travel, and thereby to live healthy, prosperous, and peaceful lives. There exists plenty of historical and legal evidence that Obama is not and cannot be an Article II “natural born Citizen” and is therefore ineligible to be President. Since the Founding, a “natural born Citizen” has been understood to be a child born in the country to citizen parents. The Founders and Framers were particularly careful to keep out of the Office of President and Commander in Chief of the Military foreign and monarchial influence. They therefore demanded that future presidents be “natural born Citizen[s].” By demanding such birth status, they assured that future presidents would be born with no allegiance to any foreign power and therefore loyal and attached only to the United States from birth. A “natural born Citizen” was well-defined in natural law and the law of nations upon which the Founders and Framers heavily relied in the early years of our Republic. Founder historian, David Ramsay (http://puzo1.blogspot.com/2010/04/founder-and-historian-david-ramsay.html) who in his A Dissertation on the Manners of Acquiring the Character and Privileges of a Citizen (1789) ( http://www.scribd.com/doc/33676461/Founder-and-Historian-David-Ramsay-Defined-Natural-Born-Citizenship-in-1789-by-Atty-Mario-Apuzzo) told us that after July 4, 1776, birthright citizenship was preserved only for a child born to U.S. citizens, making no mention of place of birth. This definition surely came from natural law and the law of nations and not from the English common law which in defining a “natural born subject” made no reference to the nationality of the parents. In his 1789 article, Ramsay first explained who the “original citizens” were and then defined the “natural born citizens” as the children born to citizen parents. He said concerning the children born after the declaration of independence, “[c]itizenship is the inheritance of the children of those who have taken part in the late revolution; but this is confined exclusively to the children of those who were themselves citizens….” Id. at 6. He added that “citizenship by inheritance belongs to none but the children of those Americans, who, having survived the declaration of independence, acquired that adventitious character in their own right, and transmitted it to their offspring….” Id. at 7. He continued that citizenship “as a natural right, belongs to none but those who have been born of citizens since the 4th of July, 1776….” Id. at 6. As we can see, Ramsay put forth a definition of a “natural born Citizen” that only depended upon the child being born to U.S. citizen parents with no mention of place of birth. Then we have Minor v. Happersett, 88 U.S. 162, 167-68 (1875) (http://www.law.cornell.edu/supct/html/historics/USSC_CR_0088_0162_ZS.html), which providing the same Vattelian definition without citing Vattel, and not in any way referring to the English common law, stated: “The Constitution does not in words say who shall be natural-born citizens. Resort must be had elsewhere to ascertain that. At common-law, with the nomenclature of which the framers of the Constitution were familiar, it was never doubted that all children born in a country of parents who were its citizens became themselves, upon their birth, citizens also. These were natives or natural-born citizens, as distinguished from aliens or foreigners. Some authorities go further and include as citizens children born within the jurisdiction without reference to the citizenship of their parents. As to this class there have been doubts, but never as to the first. For the purposes of this case, it is not necessary to solve these doubts. It is sufficient, for everything we have now to consider, that all children, born of citizen parents within the jurisdiction, are themselves citizens.” Id., 169 U.S. at 679-80. We can see from this American common law definition of a “natural-born citizen” that the Supreme Court did not rely upon the English common law for the definition, but rather on natural law and the law of nations as set forth by Vattel in Section 212 of The Law of Nations. We can also see from the Minor decision that an American “natural born Citizen” is much different from a British “natural born subject,” for the latter did not consider the nationality of the parents and also included naturalized British subjects “at birth” and after birth. There are other historical sources and cases which inform on the definition of a “natural born Citizen” but for the sake of brevity, I will not include them here. We know from Vattel and Minor that “citizens” can be the parents of “natural born Citizens” but are not necessarily “natural born Citizens” themselves. Being born in the country to citizen parents allows a child to be born with no foreign allegiance and with loyalty and attachment only to the country of his or her parents. Such birth circumstances allow a child to be born under the full and complete allegiance and jurisdiction of the United States. Obama’s father, a British citizen, was never a U.S. citizen. Hence, Obama was not born in the country to citizen parents. Because Obama’s father was not a U.S. citizen, Obama, even if born in Hawaii which he has yet to conclusively prove, was also born with allegiance to and citizenship in Great Britain. Consequently, Obama was not born with no foreign allegiance and with sole loyalty and attachment to the United States. He was not born with sole allegiance and unity of citizenship in the United States at birth, a natural condition that the Founders and Framers wanted in future presidents and commanders in chief. He was not born under the full and complete allegiance and jurisdiction of the United States. He is not and cannot be an Article II “natural born Citizen.” Under Article II, Section 1, Clause 5, he is therefore not eligible to be President and Commander in Chief. This state of affairs leaves Americans who truly care about their country and the rule of law with having to continue this fight on their own. Their fight will not go unrewarded, for as history has shown, those who persevere will in the end win.